Little Tokyo wins victory in fight over fate of former LAPD HQ. It turns out not every old building is meant to be saved. That was the message late Tuesday at a meeting of the Planning Land Use and Management committee (PLUM), which voted unanimously to deny granting Parker Center, the former Los Angeles police headquarters, historic designation status. The decision was a victory for Little Tokyo stakeholders who declared that the building represents a dark period in Los Angeles history and its demolition would pave the way for a more inclusive utilization of the space. Councilmember Jose Huizar, chair of the committee, became emotional as he read a statement prior to the vote. Other members of the committee are Councilmembers Gil Cedillo, Mitchell Englander, Marqueece Harris-Dawson and Curren Price. “This building epitomized the Parker era, it also epitomizes the unfortunately, myopic relationship to the stakeholders including but not limited to the members of the Little Tokyo community,” Huizar said. 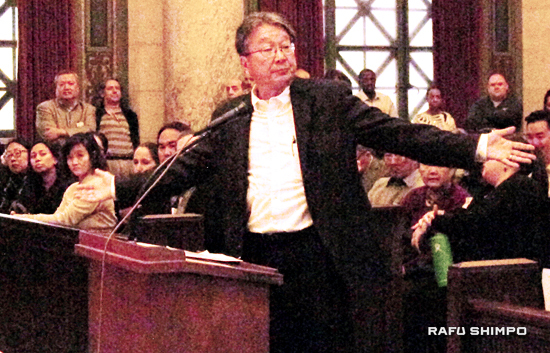 Little Tokyo is in Huizar’s district and he once worked as a paperboy for The Rafu Shimpo. He mentioned his J-Town connections during his statement. “The residents and shop owners were forcibly removed in World War II as they sent to internment camps in what is one of our most shameful moments in American history,” Huizar said, his voice breaking momentarily. “The city demolished one-quarter of Little Tokyo to build Parker Center and then turned its back end to the community,” said Yukio Kawaratani during public comments. The Little Tokyo representatives urged support of a plan that would demolish Parker Center and replace it with a 750,000-square-foot complex, creating office space, parking, and linkages to Little Tokyo that could also encompass El Pueblo and Chinatown. Advocates for preservation include L.A. Conservancy and the Los Angeles Heritage Commission. The building was designed by Welton Becket, whose other works include the Capitol Records Building, Pauley Pavilion and the Music Center. Richard Barron, an architect and president of the Los Angeles Cultural Heritage Commission, said the commission was open to the idea of adaptive reuse of the structure and was sympathetic to the concerns of Little Tokyo. The Bureau of Engineering has recommended tearing Parker Center down to build a new civic building, and even if the center received historic monument status, the city could still have demolished the building if no viable option for preservation was found. More than 80 Little Tokyo community members turned out for the meeting to express their opposition to the designation. Many told stories of lives and businesses that were uprooted to make way for the police headquarters, which opened in 1955. Alan Kumamoto said his connections to the neighborhood go back three generations. “That block was very historic and The Rafu Shimpo newspaper was on the corner of First and Los Angeles. There was a Buddhist temple there and my grandfather had both a photography store and later when he became a doctor, he had an office there,” Kumamoto said. Andy Lowe, production manager at East West Players, noted that the Asian American theater organization is adjacent to Parker Center. “History is the story we choose to tell. Is it a story of encroachment and occupation or is it a story of inclusion?” Lowe stated. City News Service reported that the issue now goes to the Entertainment and Facilities Committee, which had been holding off on a vote on the development plan until the Planning and Land Use Committee’s vote on the historical monument status. Retired Deputy Police Chief Terry Hara noted that he worked in Parker Center for 35 years and that the hallway floors were not level and doors had to be shimmied open. In 2002, a consultant’s report found that the building had a “noticeable lean” from earthquake damage and settling. “The building was tagged yellow (after the 1994 Northridge quake), it should have been tagged red,” Hara stated.